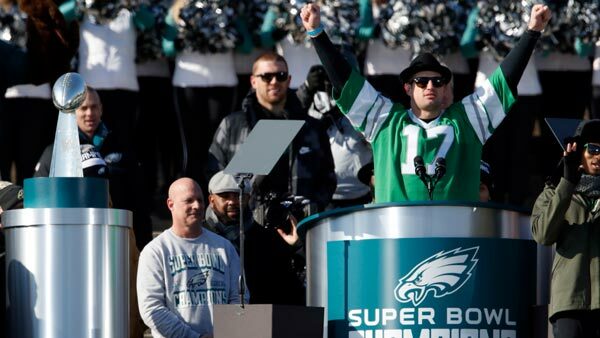 PHILADELPHIA (WPVI) -- Philadelphia fans showed their appreciation for longtime Eagles tight end Brent Celek. Hours after being released by the Eagles, the longest-tenured member of the team, appeared at the Philadelphia 76ers game Tuesday night. 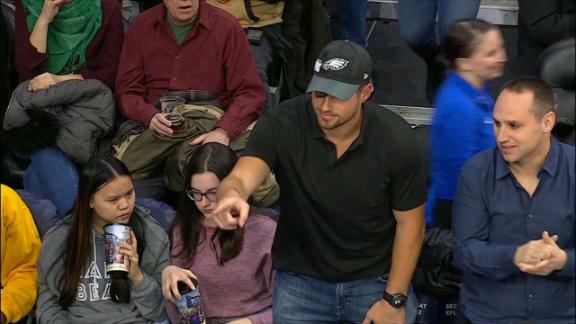 Celek was met with a standing ovation by the 76ers fans. Why Philly & #Eagles Fans are the BEST!!! An 11-year veteran, Celek was drafted by the Eagles in 2007 out of the University of Cincinnati. He leaves Philadelphia with the fourth-most receptions in Eagles history (398). Celek, who missed just one regular-season game in his 11-year career with Philadelphia, ranks fourth in team history with 175 games played behind David Akers (188), Brian Dawkins (183) and Harold Carmichael (180). The Eagles on Tuesday released veteran tight end Brent Celek, who was the longest-tenured active pro athlete in Philadelphia. "Brent Celek defines what it means to be a Philadelphia Eagle," the team said in a statement.